Jamaica is an island situated in the Caribbean Sea; world-renowned for its scenic beauty, dynamic culture, athletic exploits and warm people. Spanning 10,990 square kilometres, with a population of 2.9 million people, Jamaica is the third most populous anglophone country in the Americas. Jamaica’s primary healthcare system consists of more than 330 health centres and 24 public hospitals; the University Hospital of the West Indies (UHWI; a teaching institution partially funded by regional governments including Jamaica); and 10 private hospitals. Currently, there are only five adult rheumatologists serving our nation, all of whom do so on a full-time basis. This equates to one rheumatologist per 580,000 people, and this workforce is mainly concentrated in the southeastern region of the island. In the absence of a practicing pediatric rheumatologist on the island, adult rheumatologists are called upon to provide care to children of all ages. My journey to becoming the only rheumatologist in western Jamaica began in 2012. Prompted by the need for internists, I relocated from the capital city, Kingston, to Montego Bay to work at the Cornwall Regional Hospital (CRH). At that time, the rheumatology void in the region was being filled by once-monthly visits by a single rheumatologist, Dr. Karel DeCeulaer, who journeyed for four hours from Kingston to Montego Bay. I became his apprentice and mentee. Upon my return to Jamaica following rheumatology fellowship training at the University of Toronto, the first public rheumatology clinic in the western region was established at CRH along with an in-patient consulting service. The shortage and maldistribution of rheumatologists lead to long wait times for appointments in the private and public sectors. The workforce limitations in the public system cause waiting times of several hours, as patients are seen on a first-come, first-serve basis rather than by scheduled appointment slots during the day. This island-wide issue of wait times is currently being addressed by a Ministry of Health (MOH)-instituted pilot intervention programme. Other logistical deficiencies being addressed by the MOH include the lack of electronic patient health record systems, with the recent introduction of an electronic medical record (EMR) at UHWI. Having used several EMRs at various hospitals in Toronto, I anticipate that, with the proper training of users, efficiency will improve and there will be a greater potential for the gathering of medical data for research. The staff of the rheumatology clinic, Cornwall Regional Hospital, Jamaica. 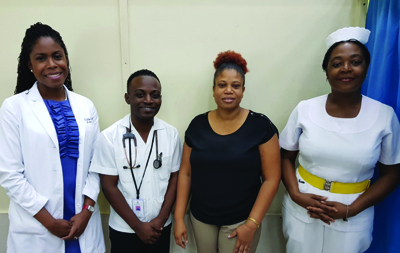 From left to right: Dr. Taneisha McGhie (rheumatologist); Dr. Delanise Lawrence (internist); Allison Johnson (secretary); Mary Trought (Departmental nursing manager). Not present are rotating residents from the department of medicine. Until we are able to increase the number of rheumatologists in Jamaica, The Arthritis Program (TAP) developed by Dr. Carter Thorne in Newmarket, Ontario provides a model of enhanced care for patients through the engagement of allied health personnel. A similar structure in Jamaica could potentially offer counselling, dietary, social and other support services that would address the unfulfilled needs that five rheumatologists otherwise have difficulty meeting. Partnered investments in telemedicine may be needed as an interim measure until a sufficient workforce is a reality. Another challenge for many patients here in Jamaica is medication access. There are subsidy programs, including the National Health Fund (NHF), through which residents obtain assistance to pay for prescription drugs, regardless of age, health and income status. However, drug shortages in the government system sometimes lead to interruption of treatment and some essential drugs for lupus, such as mycophenolate, are not covered. Currently, there are five parenteral biologic agents available. However, the uptake of these is low due to the prohibitive monthly cost of between $300 and $1,400 (Canadian dollars) even with NHF subsidy. In Jamaica, only an estimated 20% of the population have private insurance. The MOH is currently working to establish Jamaica's National Health Insurance Plan. This would greatly increase the affordability of specialist consultations, imaging and medication access, much like what is done by the Ontario Health Insurance Plan (OHIP). My tenure in Canada highlighted that, despite my country’s many achievements, Jamaica is challenged with significant unmet needs within its healthcare sector, with the specialty of rheumatology being no exception. Notwithstanding these challenges, and despite the much-publicized infrastructure and air-quality issues at CRH, the rheumatology clinic, along with the other specialty clinics, is up and running in a safe and functional environment. As we look to a brighter future in healthcare with many new governmental initiatives on the horizon, Jamaica stands to benefit from collaborations with Canada for the training of rheumatologists, guidance with healthcare models including telemedicine, research collaborations, and visiting lecturers. Here’s to hoping that the bridges built will expand and stand the test of time.